The electric counter top griddle has been a part of home kitchens for a long time. These are used as a substitute for a restaurant flat top grill. The flat surface is good for cooking multiple eggs, pancakes, burgers and more like that at a time. With the rise in ceramic cookware, it was only a matter of time before the ceramic electric griddle became an option for consumers. Ceramic cookware has become known for a being a good non-stick choice. It is more versatile and and the attractiveness has caught the eye of lots of buyers. The coating is considered way safer than more traditional Teflon cookware. Making an electric ceramic griddle seems to be the next logical step. These ceramic electric griddles may be a good option for you and your family if you are looking for a good, non-stick, chemical free product. They are known for superior heat distribution, which causes food to cook more evenly. This is important in an electric griddle because of the coils used to make the heat. A lot of electric griddles will get hotter right where the coils are and cause, "hot spots". The ceramic coating eliminates this problem by conducting the heat more evenly. However, if you are not careful, you can purchase a griddle that chips or breaks easily. Make sure you know what your particular needs are. Take into account things like convenience and ease of use. You may want to decide if the features of the ceramic coated electric griddle justifies the cost. So, how do we navigate through the choices? In this guide, we will attempt to inform you on the pros and cons of the ceramic electric griddle. We will explore reviews and descriptions for a few individual models of these griddles. We will try to give you the most helpful and unbiased information that we can. Hopefully, this will give you as much information in one place as you need to make your decision easier. This guide is meant to be a resource to help you find the best ceramic electric griddle. By the time you read this article, you should have a good foundation to make your choice. When buying a ceramic coated electric griddle, you need to look for certain things. Cost is always a concern. There are some very good products out there that have some amazing price-points. There are also some that are cheaply made and cheaply priced. Paying more doesn't necessarily mean more value though. Some of the higher priced models may have features that are not useful to you. Consider the size that you need for your kitchen and family. You may need a smaller model because of counter space issues and you may need a larger one for a bigger family. Think about where you will store the electric griddle when not in use. 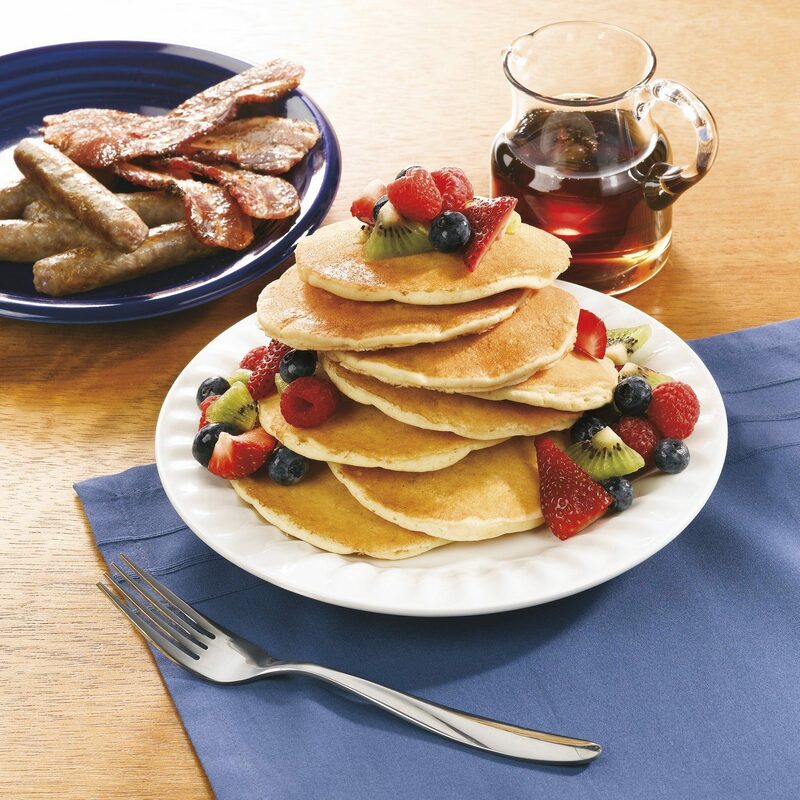 Ceramic griddles have lots of benefits. Unlike traditional "Teflon" coatings, the ceramic coating is chemical free. Other coatings have been known to leak chemicals into food. They are healthier because you don't need oil or butter to cook with. The surface is non stick. The manufacturers actually encourage you not to use these things because they may build up a coating that effects the original non stick coating. Ceramic conducts heat better than other materials. This causes heat to distribute better and food to cook more evenly. 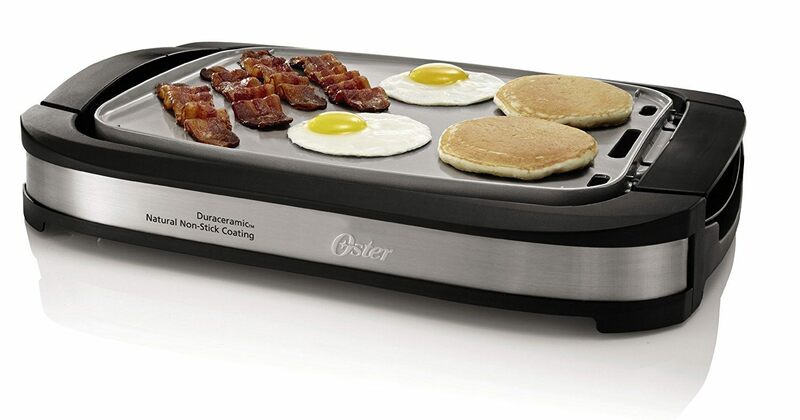 The Oster CKSTGRFM18W-ECO DuraCeramic Griddle with warming tray is the first model that we looked at. It is black and creme in color. The cooking surface is a rather large 10x18 inches in dimension. It comes with a warming tray that keeps food warm while you are cooking more. The DuraCeramic coating is advertised to last four times longer than other surface coatings. Temperature controls are removable to make cleaning easier. No preheating of this model is necessary. It comes with a one year limited warranty. When looking at reviews, it appears that buyers of this product liked the easy to clean surface. Most said that all they had to do was wipe with a towel and it was all clean. A large surface on this model is enjoyed because it makes the user capable of cooking for a larger group of people. The price is also affordable. Among these helpful reviews are a few dissenters though. Some customers were not impressed by the warming tray. They believed it was too cheaply made and some even said that it left a plastic taste on food that was left to warm there. There seemed to be some complaints about the drip tray for the grease. Some said it was too small and kind of inconvenient. The most common complaint was that the non-stick coating seemed to wear off easily and was not very durable. They seemed to think the cooking surface was rough and inconsistent. Another complaint was that the electric griddle's ceramic surface seemed to get warmer towards the edges. Some minor complaints were that the decorative surface stains easily and you have a hard time keeping it clean. Some of the griddles would develop brown spots on the cooking surface near the elements. It seems if cost is a consideration, then this may be a model to consider if you want to take some chances. Oster has proven to be a pretty reliable brand, and for the cost, If cost and a large cooking surface are features that appeal to you this may be the model for you. You should probably be more careful with the non stick coating and watch for possible cooking "hot spots". Emptying the grease tray more often may prove helpful also. This model seems to fit for some people and has more good reviews than bad. 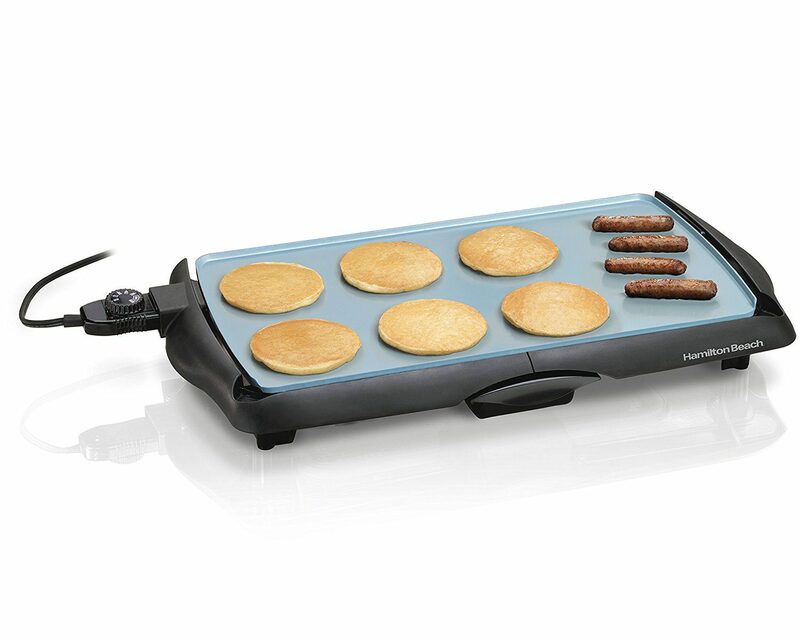 Hamilton Beach offers the model number 38518 Durathon Ceramic Griddle. This model comes in black. The ceramic coating on this one also claims to be four times more durable than traditional coatings. It has an 11x20 cooking surface and boasts 200 square inches of cooking area. As with all ceramic coated products, they are chemical free. This particular model is submersible in water if the cord is taken off the unit. The affordability is in a very good range. All the removable parts (except the cord) are dishwasher safe for easier cleaning. The reviews were good on this one and it was hard to find many problems. Several people commented on how lightweight this griddle is. Another thing that seemed to impress more than a few people was that it heated up very quickly and seemed to cook evenly. Even though this unit heats up quickly, some people like that the handles and contact surfaces did not get hot to the touch. Most good reviews stated that this product had a really good non stick surface. Customers did, however, have a few complaints. Among the more frequent problems with this ceramic griddle is that the cord was too short, making for awkward placement. There were concerns about the drip pan being higher than the actual cooking surface. This caused the drain off to be slow and hard for some to compensate for. The temperature control got some bad comments because it was felt to be a little too touchy. Home cooks seemed to believe that using utensils other than plastic or wood scratched the surface a little more easily than they had hoped. Overall the reviews for this grill were more positive than negative. The problems seemed to stem from maybe some quality control issues and letting a few slip through with a good check. Hamilton Beach is a major manufacturer of small kitchen appliances. The volume of product is probably a direct proportion to any quality issues they have. This model seems to be a really good choice for the price. While the main problems seem to be design flaws and some quality control issues, the reviews by the actual customers are mainly favorable. Larger cooking area and consistency of heating are a reliable bet with this product. This is one to consider for you home cooking needs. 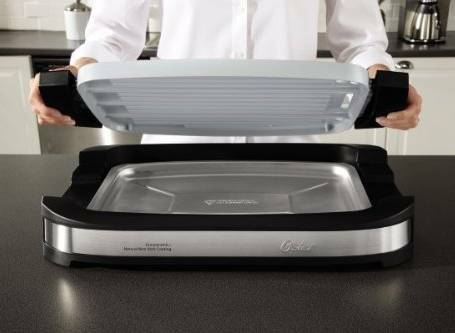 Oster offers many models, including the model number CKSTGR3007-ECO DuraCeramic Reversible Grill and Griddle. This particular model comes in black. The DuraCeramic coating lasts four times longer than other traditional coatings. It has a plate that is reversible. It has a flat top on one side and a raised grill plate on the other side. This plate is completely dishwasher safe for easy cleaning. The description says that it heats up twenty percent faster than other grills. The handles are cool to the touch and the outside surfaces do not get hot. It comes with a 10x18 cooking surface perfect for large groups. The warming tray helps to keep food at optimal temperature while you are cooking more. There were alot of things to like about this product. People who bought this were generally pleased with the appearance. It is convenient because it goes in the dishwasher when the plug is removed. The construction was reviewed to be very sturdy. Customers were impressed by how evenly and consistently this griddle heats. There were very few complaints about the durability of the non stick coating and most people were very impressed by it. The biggest complaint was that the cord did not fit very well. There were quite a few concerns about the cord not connecting well with the unit. The cord doesn't always seem to work well either. This may be because of faulty wiring and may be because of the connection issues. Some people that purchased this unit complained because it was too large to fit inside their dishwasher. Another issue was that the griddle had no splash guard. Price was a concern for some. This product has way more good reviews than bad. Consumers seemed to be impressed with the overall quality of this griddle. People experienced way fewer problems with this than with products that sold for less. For the price, the appearance, ease of use, and dependable features seem to be worthy of a look. If the price doesn't turn you off, then this may be the ceramic griddle for you. Check any size concerns with counter spaces and dishwashers. Just take care that the power plug is sufficiently in place and your problems should be minimal with this electric ceramic griddle. The last one that we looked at was a bit harder to run down. The Toastmaster TM-164GRC Ceramic Griddle does not have very many reviews yet. This ceramic grill electric fueled griddle is our mid priced addition to the guide. This model comes in a gray finish. It has the same ceramic coating as the others and is non stick. It has a larger cooking surface. At 10x19 it is the second largest electric grill ceramic coated that we have reviewed. The edges and non cooking surfaces are cool to the touch. It describes even temperatures with a thermostat that can be set to any temperature between 150 and 400 degrees fahrenheit. All detachable parts are dishwasher safe. This also has a large slide-out drip tray. As we have said, there are not very many reviews for this one, but the ones we found were mostly good. Only two had anything negative to say. People seemed to think that this griddle was very easy to clean and that the non stick coating held up well. There was very little question about durability. Some customers said that this was the perfect size for cooking and the perfect size for storing. Reviews said that this product was "just as described". The middle of the way pricing was impressive and they liked the cool touch features. The complaints were about the grease drip tray. They think it should be larger. The only really bad review we found said that food burns in the places where the elements are. No one else seemed to have this problem, however. If you don't want to buy the most expensive model but you are concerned with the quality of the lower priced models, this may be the one you want. The reasonable price, coupled with features that appeal to most buyers make this unit one to consider. So, if you are looking for something more tried and true you may want to hold out a little while on this one. Toastmaster is a good brand and has a fairly good track record, but this is the only one we looked at in this price range. Ceramic griddles can be a good investment for any kitchen. Finding the best ceramic electric griddle is time consuming. We hope that this guide has provided you with some information to get you on the way to your next purchase. Finding the perfect balance of cost and features is up to you. 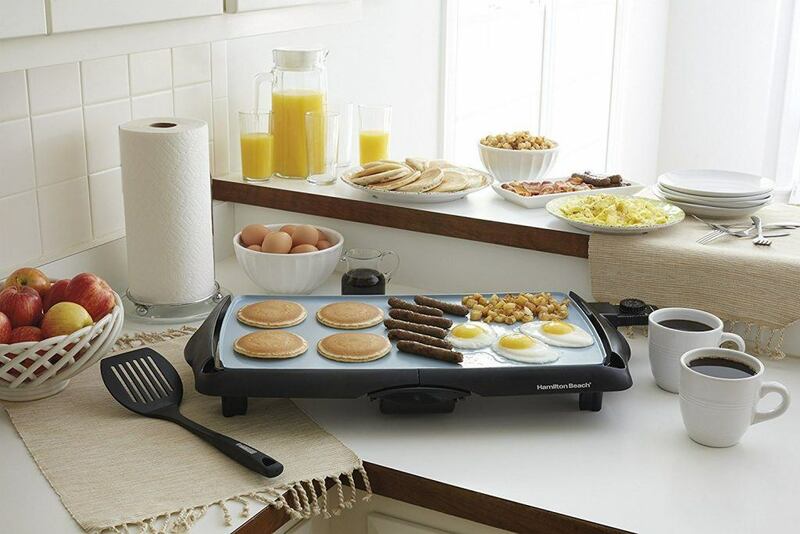 Just decide which features you need for your circumstances and have fun using your new ceramic griddle.